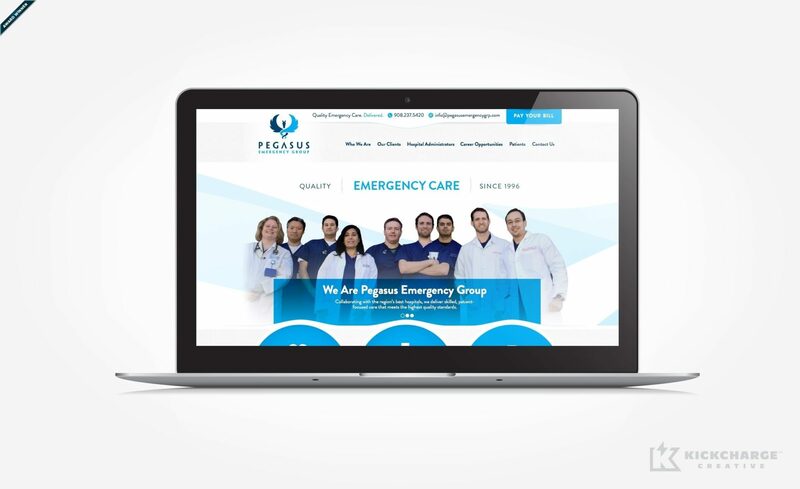 Pegasus Emergency Group started with a vision to provide the best emergency care possible by establishing a local democratic group of physicians dedicated to providing compassionate and superior emergency medical care to patients. As critical as its services were, its brand and digital presence were in need of an upgrade. Both the logo and website looked out-of-date, and did not adequately reflect its values or overall mission. The company desired a unique logo that offered brand recognition and standardization as it grew, according to Nimish Mehta of Pegasus Emergency Group. 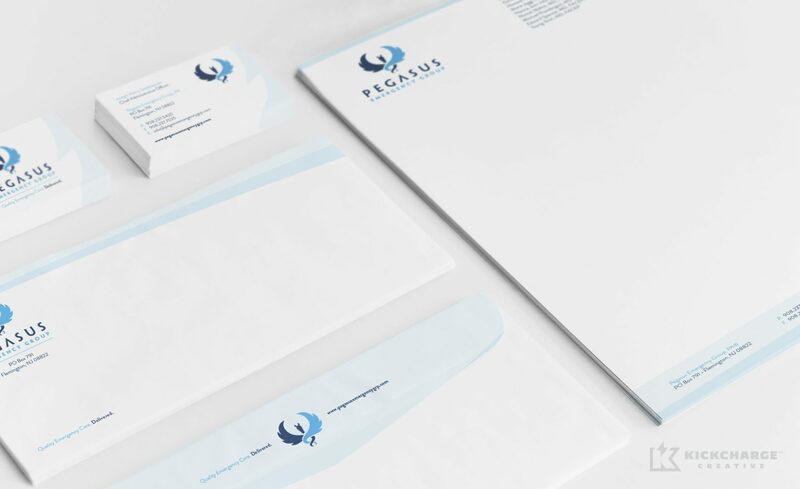 Upon partnering with KickCharge Creative, we immediately got to work on a logo redesign that would accurately reflect the company’s mission and values. Our goal with the new logo was to convey a spirit of professionalism, credibility and expertise. We achieved this goal through a contemporary approach to fonts, using a navy and cyan color palette that correlates with the traditional medical industry color of blue. The icon features a stylized winged horse that both reflects the company name and evokes the suggestion of traditional medical symbols. Our research indicated that both audiences must be addressed equally, a 50/50 split in terms of messaging and brand identity. So we carefully organized the new website so each target audience could quickly and easily find the links and information they’re looking for, with minimal clicks or searching. The end result was wildly successful, helping to establish brand credibility with area hospitals, and potential staffers. KickCharge Creative “created an amazing logo, brand, colors, and attractive website that conveys what we stand for,” said Nimish. In fact, the logo placed third in the 2014 Jersey Awards from the NJ AD Club. Pegasus is a textbook example of how we can create complicated, multi-faceted websites that don’t seem “weighed down” or cluttered with links. The clean, graphic logo and web presence is extraordinarily easy to navigate, maintaining its elegance and graphic look while conveying a massive amount of information. Nimish is actively using the new site and brand to grow, with the hopes of procuring new sites to manage. Modern web design is all about balancing function and design. At KickCharge, that’s a skill we do better than anyone.